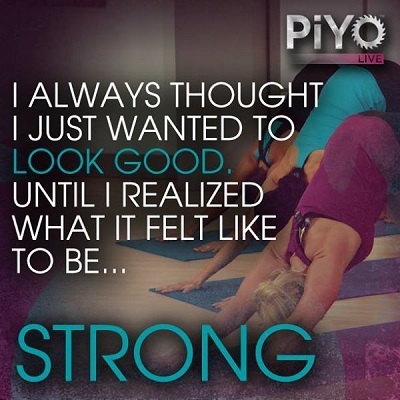 The Fourth PiYo workout to find out more about is called SWEAT! This is a 35 minute workout designed to make you do what? You guessed it! To make you sweat! “But I thought there wasn’t any jumping or high impact exercises in PiYo? !” you may ask yourself. You’re right! You can sweat without all that stuff! The fast paced yoga makes your heart rate increase and leaves you with a dynamic conditioning and body weight resistance workout for your entire body! I’m very much looking forward to this workout, as the “Power” sections in PiYo live are my favorite…They give you that burst of cardio without high impact…I’m anticipating something similar for this DVD, but who knows…Chalene might surprise me with something even better! This entry was posted in PiYo and tagged cardio, exercise, fit, fitness, health, healthy, inspiration, lifestyle, motivation, muscle, pilates, piyo, progress, results, strength, sweat, training, weightloss, workout, yoga on June 24, 2014 by AngelinaFitness.